Thomas Cook Airlines (UK) (Manchester) has announced that it is expanding its services to the United States from its Manchester hub. From May 2016, the carrier will fly to Los Angeles and Boston. Thomas Cook’s fleet of Airbus A330-200s will most likely serve the routes, which, as previously reported, already serve routes to New York (JFK) and Miami as well as seasonal services to Las Vegas and Orlando. Unfortunately, if you are one of the people eagerly waiting for Thomas Cook to open its seasonal service from London Gatwick to Reno, Nevada beginning on December 19, your luck may be out. The Reno Gazette is reporting that the carrier has abandoned its plans for the route, citing U.S. Customs’ inability to process London arrivals at Reno-Tahoe International Airport in a timely manner. Copyright Photo: Stefan Sjogren/AirlinersGallery.com. Airbus A330-243 G-OMYT (msn 301) in the old 2002 livery with the Sunny Heart tail logo prepares to land at Stockholm (Arlanda). This entry was posted in Thomas Cook Airlines (UK) and tagged 301, A330, A330-200, A330-243, Airbus, Airbus A330, Airbus A330-200, Arlanda, ARN, Boston, G-OMYT, london gatwick, Los Angeles, Manchester, Reno, Reno-Tahoe International Airport, Stockholm, Thomas Cook, thomas cook airlines, Thomas Cook Airlines (UK) on May 10, 2015 by Bruce Drum. Thomas Cook Airlines (UK) (Manchester) has begun its newest services to North America from its base at Manchester. With twice-weekly flights to Miami began on May 3 and thrice weekly New York JFK services beginning on May 5 respectively. The services are being flown by the carrier’s fleet of Airbus A330-200s, with the inaugural flight to Miami being served by the first aircraft to be fully painted in the airline’s new 2013 “Sunny Heart” livery. Thomas Cook also began seasonal services between Glasgow (International) and Las Vegas on May 4. The first Miami flight was treated with the signature water canon salute (above). Photo Above: Thomas Cook Airlines. 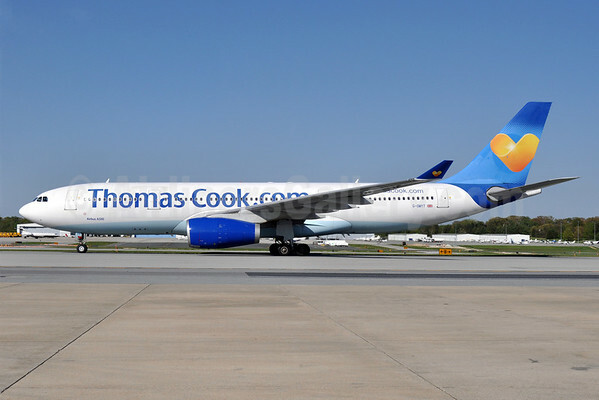 This entry was posted in Thomas Cook Airlines (UK) and tagged A330, Airbus, Airbus A330, JFK, Manchester, Miami, New York, thomas cook airlines on May 6, 2015 by Bruce Drum. Video: Thomas Cook Airlines. Cabin refurbishment of Thomas Cook Airlines‘ Airbus A330, carried out at Monarch Aircraft Engineering’s hangar facility at Manchester Airport. This entry was posted in Thomas Cook Airlines (UK) and tagged A330, Airbus, Airbus A330, Manchester Airport, thomas cook airlines on January 25, 2015 by Bruce Drum. 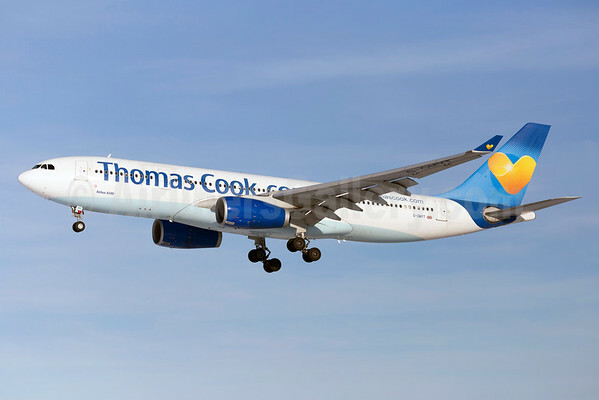 Thomas Cook Airlines (UK) (Manchester) will launch seasonal twice-weekly Airbus A330-200 London (Gatwick)-Reno flights from December 19, 2015 through April 9, 2016 per Airline Route. Copyright Photo: Tony Storck/AirlinersGallery.com. Airbus A330-243 G-OYMT (msn 301) taxies at Baltimore/Washington (BWI). This entry was posted in Thomas Cook Airlines (UK) and tagged 301, A330, A330-200, A330-243, Airbus, Airbus A330, Airbus A330-200, Baltimore/Washington, BWI, G-OMYT, Gatwick, London, Reno, Reno Nevada, Sunny Heart, thomas cook airlines, Thomas Cook Airlines (UK) on November 4, 2014 by Bruce Drum. 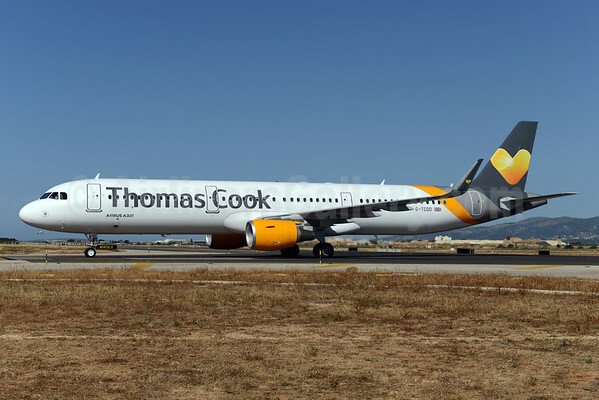 Thomas Cook Airlines (UK) (Manchester) has announced that for the summer schedule of 2015, it will operate long-haul flights from London’s Stansted Airport to Orlando, Cancun and Las Vegas, becoming the only airline to offer a long haul program from the airport. Last year, Thomas Cook Airlines announced that from this June it will operate two aircraft from Stansted Airport – using the larger Airbus A321 aircraft replacing the existing Airbus A320 – bringing an increased amount of flights and holidays which are now on sale for holidaymakers from the East and South East of England to a range of new destinations. With the long-haul flights on a larger Airbus A330, the additional flights in 2015 will begin on the weekend of Friday, July 17, 2015 with two flights a week to Orlando and one per week to both Cancun and Las Vegas – and continue up until August 17, 2015. In other news, the airline also announced that for the summer of 2015, it will operate a weekly flight to Las Vegas from Glasgow Airport following a series of one-off flights to the U.S. in recent summers. Operating each Monday with the Airbus A330 fleet, the new flights in 2015 will begin on Monday 4 May 4, 2015 and continue until October 31, 2015. Previously the airline announced new Airbus A330 routes from Manchester to both New York (JFK) and Miami. Copyright Photo: Keith Burton/AirlinersGallery.com. Airbus A330-243 G-OJMC (msn 456) approaches the runway at London’s Gatwick Airport (LGW). This entry was posted in Thomas Cook Airlines (UK) and tagged 456, A330, A330-200, A330-243, Airbus, Airbus A330, Airbus A330-200, Cancun, G-OJMC, Gatwick, Las Vegas, LGW, London, london stansted airport, Orlando, Stansted, stansted airport, thomas cook airlines, Thomas Cook Airlines (UK) on May 5, 2014 by Bruce Drum. 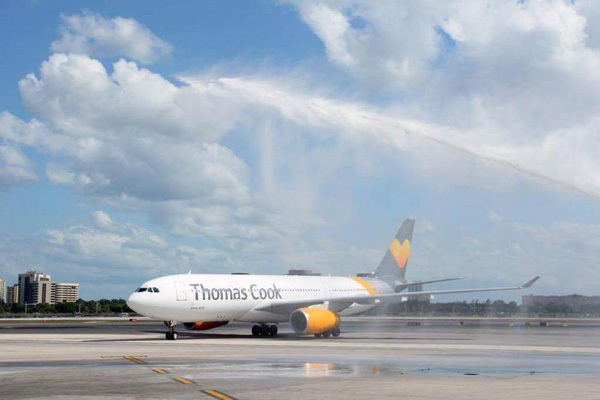 Thomas Cook Airlines (UK) (Manchester) is returning and will commence scheduled passenger services at Miami International Airport (MIA) effective on May 3, 2015. 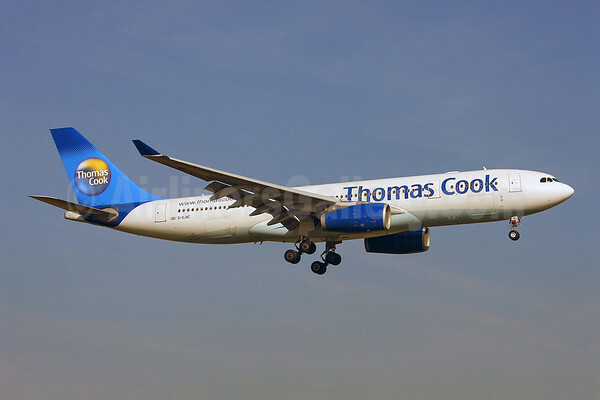 Thomas Cook plans on operating twice-weekly nonstops between Manchester and MIA utilizing Airbus A330-200 aircraft. The new route is seasonal and is expected to be operated for eight months. The airline is also starting three times a week service from Manchester to New York (JFK) starting also in May. The airline currently operates from Manchester to Orlando and Las Vegas. Copyright Photo: Arnd Wolf/AirlinersGallery.com. Airbus A330-243 G-OMYT (msn 301) with the new Thomas Cook Group “Sunny Heart” logo on the tail arrives in Munich. This entry was posted in Thomas Cook Airlines (UK), Thomas Cook Group and tagged 301, A330, A330-200, A330-243, Airbus, Airbus A330, Airbus A330-200, G-OMYT, Manchester, MIA, Miami, Miami International Airport, MUC, Munich, New York, Thomas Cook, thomas cook airlines, Thomas Cook Airlines (UK), Thomas Cook Group on April 29, 2014 by Bruce Drum.